Do you need something different to give as a baby shower gift? Especially, for someone who already has all the baby stuff they need. If you answered yes then you can thank Claire Jane for saving the day. 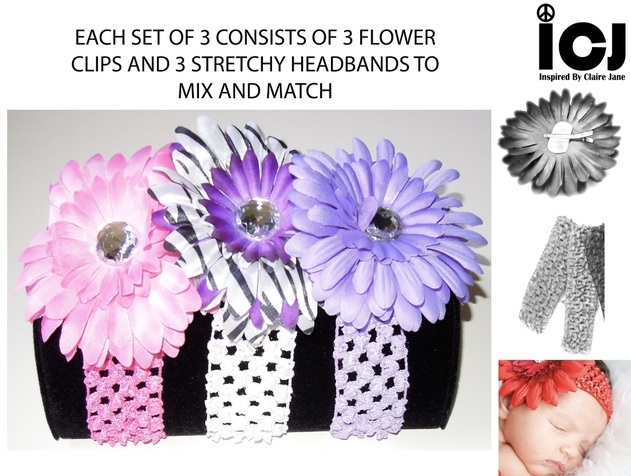 She’s created some fashionable Baby Headbands for her ICJ line that are downright adorable. They come in sets of three and feature colored flowers with a rhinestone center. 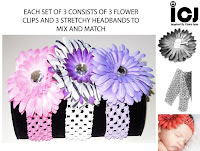 The flower clips are interchangeable so you can mix and match to create a variety of combinations. They’re also a bargain at $24, especially when all your friends are expecting at the same time. Plus, it’s good to train them young.